E. Anglesey takes his Seat. Richard Earl of Anglesey sat first in Parliament, after the Death of his Cousin Arthur Earl of Anglesey; having, at the Table, first taken the Oaths, and made and subscribed the Declaration, and also taken and subscribed the Oath of Abjuration, pursuant to the Statutes. Barony Clifford, Notice to Att. Gen. It is Ordered, That the said Committee do meet on Monday Sevennight, to take the same into Consideration; and that, in Behalf of the Crown, Notice be given to His Majesty's Attorney General. Hodie 3a vice lecta est Billa, intituled, "An Act for Sale of Part of the settled Estate of George Cary Esquire, lying in the County of Devon, for discharging several Debts and Encumbrances of his late Father and Grandfather; and for settling an Estate in the County of Middlesex to the Uses of his Marriage Settlement." Message from thence, to return the E. of Winchilsea's Bill. 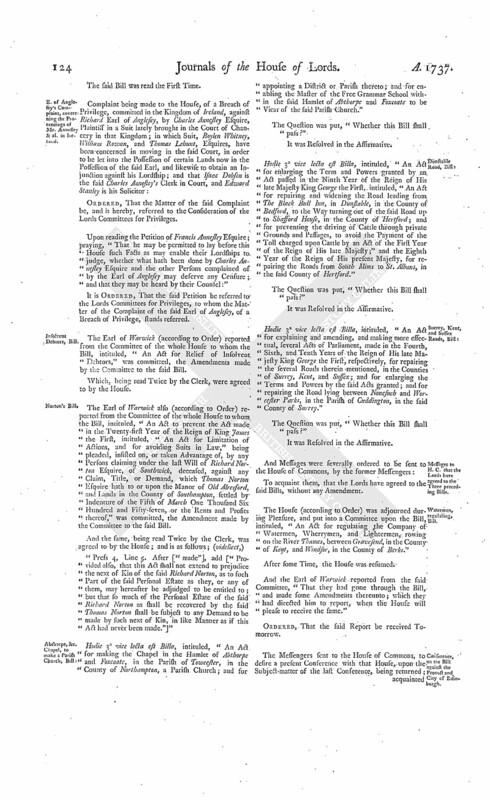 To return the Bill, intituled, "An Act for Sale of Part of the Estate of Daniel late Earl of Winchilsea and Nottingham, deceased, for Payment of Debts and Encumbrances charged upon and affecting the same; and for other Purposes therein mentioned;" and to acquaint this House, that they have agreed to the same, with some Amendments, whereunto they desire their Lordships Concurrence. 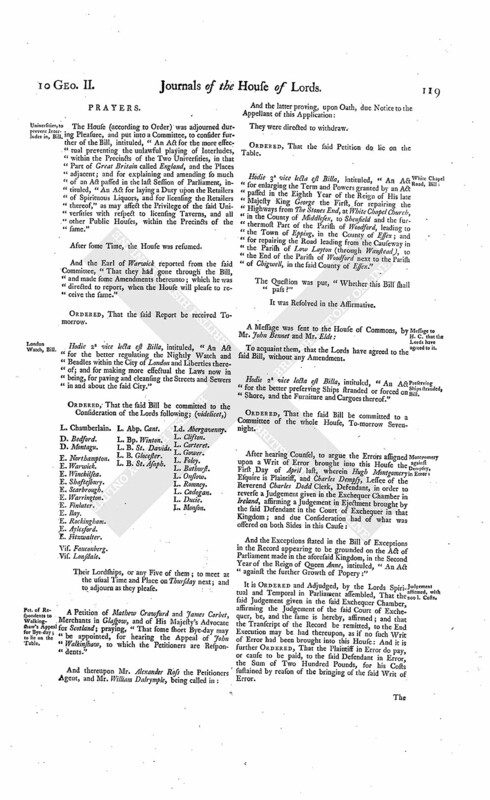 To return the Bill, intituled, "An Act to enable Peter Shakerley and George Shakerley, Sons of George Shakerley Esquire, to make suitable Jointures for their Wives, and Provision for their Daughters and Younger Sons, out of the Estates of the said George Shakerley the Father, lying in the Counties of Chester and Lancaster;" and to acquaint this House, that they have agreed to the same, without any Amendment. 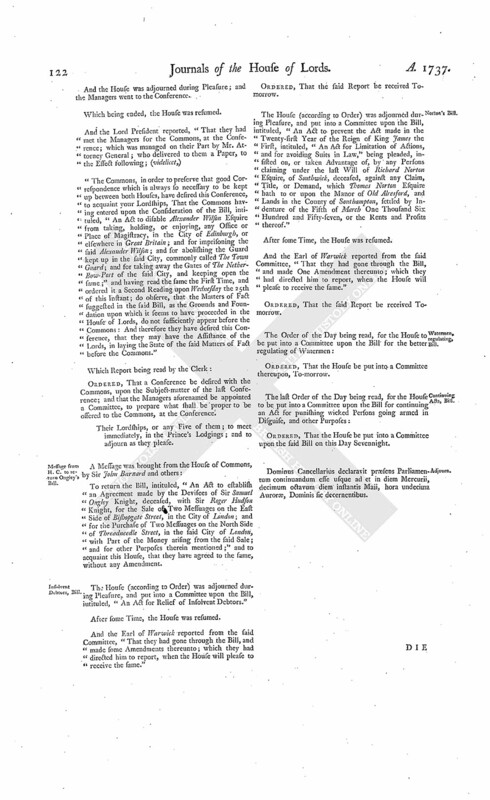 To return the Bill, intituled, "An Act to enable the Guardians of Anthony Langley Swymmer, an Infant, to join in making Leases of certain Mines, in the County of Flint, with the other Owners thereof, during the Minority of the said Infant;" and to acquaint this House, that they have agreed to the same, without any Amendment. and Sir W. Dudley's Bill. To return the Bill, intituled, "An Act for enroling of certain Indentures of Lease and Release, executed by Sir William Dudley and Dame Elizabeth his Wife; and for making the Examplification and attested Copies of such Indentures, and also of an Act of Parliament, and certain Articles of Agreement therein referred to, Evidence in all Courts of Law and Equity in Ireland;" and to acquaint this House, that they have agreed to the same, with One Amendment, whereunto they desire their Lordships Concurrence. The said Amendment, being read, was agreed to. The Lord Onslow reported from the Lords Committees to whom the Bill, intituled, "An Act for re-building the Church of the Parish of St. Olave, in the City of London, and in the Borough of Southwark, in the County of Surrey," was committed: "That they had considered the said Bill, and examined the Allegations thereof, which were found to be true; and that the Committee had gone through the Bill, and directed him to report the same to the House, without any Amendment." Surrey, Kent, and Sussex Roads, Bill. Hodie 2a vice lecta est Billa, intituled, "An Act for explaining and amending, and making more effectual, several Acts of Parliament, made in the 4th, 6th, and 10th Years of the Reign of His late Majesty King George the First, respectively, for repairing the several Roads therein mentioned, in the Counties of Surrey, Kent, and Sussex; and for enlarging the Terms and Powers by the said Acts granted; and for repairing the Road lying between Nonesuch and Worcester Parks, in the Parish of Cuddington, in the said County of Surrey." Viscount Fauconberg. L. Abp. Cant. With a Bill, intituled, "An Act for continuing an Act for the more effectual punishing wicked and evildisposed Persons going armed in Disguise, and doing Injuries and Violences to the Persons and Properties of His Majesty's Subjects; and for the more speedy bringing the Offenders to Justice; and for continuing Two Clauses, to prevent the cutting or breaking down the Bank of any River or Sea Bank, and to prevent the malicious cutting of Hop-binds, contained in an Act passed in the Sixth Year of His present Majesty's Reign; and for the more effectual Punishment of Persons removing any Materials used for securing Marsh or Sea Walls or Banks; and of Persons maliciously setting on Fire any Mine, Pit, or Delph of Coal; or Cannel Coal; and of Persons unlawfully hunting, or taking any Red or Fallow Deer in Forests or Chases, or beating or wounding Keepers, or other Officers, in Forests, Chases, or Parks; and for effectual securing the Breed of Wild Fowl;" to which they desire the Concurrence of this House. Abthorpe, &c. Chapel, to be a Parish Church, Bill. 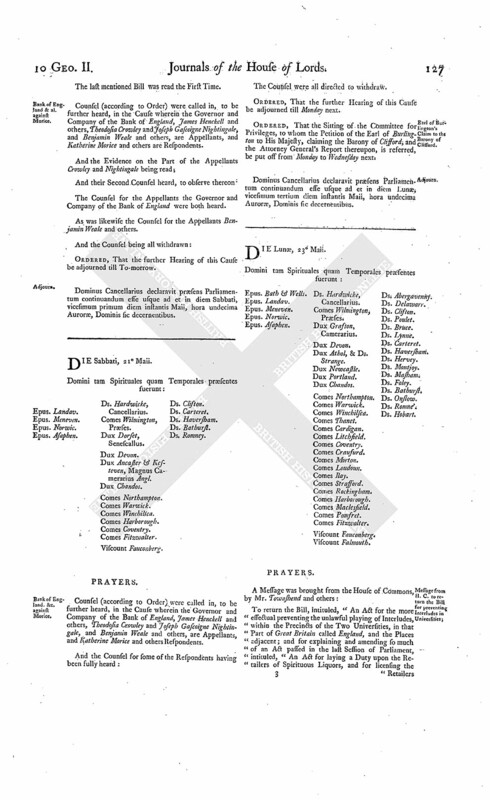 With a Bill, intituled, "An Act for making the Chapel in the Hamlet of Abthorpe and Foxcoate, in the Parish of Towcester, in the County of Northampton, a Parish Church; and for appointing a District or Parish thereto; and for enabling the Master of the Free Grammar School within the said Hamlet of Abthorpe and Foxcoate to be Vicar of the said Parish Church;" to which they desire the Concurrence of this House. Against Provost and City of Edinburgh, Bill. The House (according to Order) was adjourned during Pleasure, and put into a Committee upon the Bill, intituled, "An Act to disable Alexander Wilson Esquire from taking, holding, or enjoying, any Office or Place of Magistracy in the City of Edinburgh, or elsewhere in Great Britain; and for imprisoning the said Alexander Wilson; and for abolishing the Guard kept up in the said City, commonly called The Town Guard; and for taking away the Gates of The Nether Bow Port of the said City, and keeping open the same." And the Lord Lovell reported from the said Committee, "That they had gone through the Bill, and made some Amendments thereunto; which they had directed him to report, when the House will please to receive the same." And the Bill was read a Second Time. And Mr. Chute and Mr. Hamilton were heard, as to the Petitioner's Right being affected by the Bill, and how far. And they acquainted the House, "That the Petitioners have brought a Bill in Chancery, for an Accompt of the Personal Estate of the late Mr. Norton, of Southwick, against the Administrators; to which they have answered, and the Cause is at Issue." And Part of the Answer as to the Words of the Will (fn. 1) were read. Then Mr. Lloyd and Mr. Murray were heard for the Bill, as to the Point above-mentioned. Ordered, That the further Hearing of Counsel upon the said Bill be adjourned till To-morrow. Dominus Cancellarius declaravit præsens Parliamentum continuandum esse usque ad et in diem Jovis, duodecimum diem instantis Maii, hora undecima Auroræ, Dominis sic decernentibus. Hodie 2a vice lecta est Billa, intituled, "An Act for making the Chapel in the Hamlet of Abthorpe and Foxcoate, in the Parish of Towcester, in the County of Northampton, a Parish Church and for appointing a District or Parish thereto; and for enabling the Master of the Free Grammar School, within the said Hamlet of Abthorpe and Foxcoate, to be Vicar of the said Parish Church." Viscount Falmouth. L. Ap. Cant. Hodie 2a vice lecta est Billa, intituled, "An Act for continuing an Act for the more effectual punishing wicked and evil-disposed Persons going armed in Disguise, and doing Injuries and Violences to the Persons and Properties of His Majesty's Subjects; and for the more speedy bringing the Offenders to Justice; and for continuing Two Clauses, to prevent the cutting or breaking down the Bank of any River or Sea Bank, and to prevent the malicious cutting of Hopbinds, contained in an Act passed in the Sixth Year of His present Majesty's Reign; and for the more effectual Punishment of Persons removing any Materials used for securing Marsh or Sea Walls or Banks, and of Persons maliciously setting on Fire any Mine, Pit, or Delph, of Coal, or Cannel Coal; and of Persons unlawfully hunting, or taking any Red or Fallow Deer, in Forests or Chases, or beating or wounding Keepers, or other Officers, in Forests, Chases, or Parks; and for more effectually securing the Breed of Wild Fowl." The House proceeded to take into Consideration the Amendments made by the Commons to the Bill, intituled, "An Act for Sale of Part of the Estate of Daniel late Earl of Winchilsea and Nottingham, deceased, for Payment of Debts and Encumbrances charged upon and affecting the same; and for other Purposes therein mentioned." And the same, being read, were agreed to by the House. Ordered, That the Writ of Error which stands for an Hearing this Day, wherein Hugh Montgomery is Plaintiff, and Charles Dempsey Defendant, be put off to Monday next; and the Cause for To-morrow to Wednesday next; and the other Causes on Cause-days removed in Course. Universities, to prevent Interludes, &c. in, Bill. 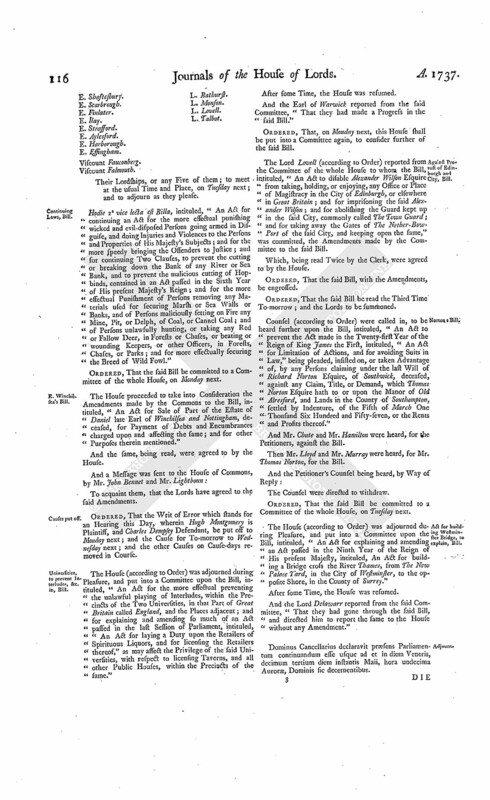 The House (according to Order) was adjourned during Pleasure, and put into a Committee upon the Bill, intituled, "An Act for the more effectual preventing the unlawful playing of Interludes, within the Precincts of the Two Universities, in that Part of Great Britain called England, and the Places adjacent; and for explaining and amending so much of an Act passed in the last Session of Parliament, intituled, "An Act for laying a Duty upon the Retailers of Spirituous Liquors, and for licensing the Retailers thereof," as may affect the Privilege of the said Universities, with respect to licensing Taverns, and all other Public Houses, within the Precincts of the same." And the Earl of Warwick reported from the said Committee, "That they had made a Progress in the said Bill." Ordered, That, on Monday next, this House shall be put into a Committee again, to consider further of the said Bill. Against Provost of Edinburgh and City, Bill. The Lord Lovell (according to Order) reported from the Committee of the whole House to whom the Bill, intituled, "An Act to disable Alexander Wilson Esquire from taking, holding, or enjoying, any Office or Place of Magistracy in the City of Edinburgh, or elsewhere in Great Britain; and for imprisoning the said Alexander Wilson; and for abolishing the Guard kept up in the said City, commonly called The Town Guard; and for taking away the Gates of The Nether-BowPort of the said City, and keeping open the same," was committed, the Amendments made by the Committee to the said Bill. Ordered, That the said Bill be read the Third Time To-morrow; and the Lords to be summoned. Counsel (according to Order) were called in, to be heard further upon the Bill, intituled, "An Act to prevent the Act made in the Twenty-first Year of the Reign of King James the First, intituled, "An Act for Limitation of Actions, and for avoiding Suits in Law," being pleaded, insisted on, or taken Advantage of, by any Persons claiming under the last Will of Richard Norton Esquire, of Southwick, deceased, against any Claim, Title, or Demand, which Thomas Norton Esquire hath to or upon the Manor of Old Alresford, and Lands in the County of Southampton, settled by Indenture, of the Fifth of March One Thousand Six Hundred and Fifty-seven, or the Rents and Profits thereof." And Mr. Chute and Mr. Hamilton were heard, for the Petitioners, against the Bill. Then Mr. Lloyd and Mr. Murray were heard, for Mr. Thomas Norton, for the Bill. The House (according to Order) was adjourned during Pleasure, and put into a Committee upon the Bill, intituled, "An Act for explaining and amending an Act passed in the Ninth Year of the Reign of His present Majesty, intituled, An Act for building a Bridge cross the River Thames, from The New Palace Yard, in the City of Westminster, to the opposite Shore, in the County of Surrey." And the Lord Delawarr reported from the said Committee, "That they had gone through the said Bill, and directed him to report the same to the House without any Amendment." Dominus Cancellarius declaravit præsens Parliamentum continuandum esse usque ad et in diem Veneris, decimum tertium diem instantis Maii, hora undecima Auroræ, Dominis sic decernentibus. The Earl of Warwick reported from the Lords Committees to whom the Bill, intituled, "An Act for Sale of the Manor of Kippax, in the County of York, Part of the settled Estate of Sir Reginald Graham Baronet; and for settling his Estates at Norton and Nunwick, in the same County, being of greater Value, to the same Uses; and for making a Partition of the Manor of Whitwell, between him and his Brother Richard Graham Esquire," was committed: "That they had considered the said Bill, and examined the Allegations thereof, which were found to be true; that the Parties concerned had given their Consents; and that the Committee had gone through the Bill, and made some Amendments thereunto." Hodie 3a vice lecta est Billa, intituled, "An Act for re-building the Church of the Parish of St. Olave, in the City of London, and in the Borough of Southwark, in the County of Surrey." Hodie 3a vice lecta est Billa, intituled, "An Act for explaining and amending an Act passed in the Ninth Year of the Reign of His present Majesty, intituled, An Act for building a Bridge cross the River Thames, from The New Palace Yard, in the City of Westminster, to the opposite Shore, in the County of Surrey." With a Bill, intituled, "An Act for the better preserving Ships stranded or forced on Shore, and the Furniture and Cargoes thereof;" to which they desire the Concurrence of this House. London Streets, Watch, &c. Bill. 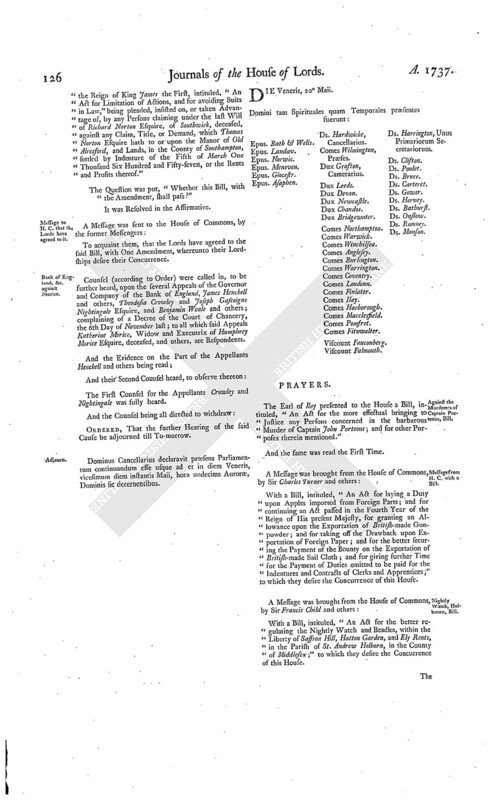 With a Bill, intituled, "An Act for the better regulating the Nightly Watch and Beadles, within the City of London and Liberties thereof; and for making more effectual the Laws now in being, for paving and cleansing the Streets and Sewers in and about the said City;" to which they desire the Concurrence of this House. The Earl of Warwick reported from the Lords Committees to whom the Bill, intituled, "An Act for naturalizing Bartholomew Baratty," was committed: "That they had considered the said Bill, and likewise the Petitions of some Persons to be inserted therein; and that the Committee had gone through the Bill, and made some Amendments thereunto." The Earl of Warwick also reported from the Lords Committees to whom the Bill, intituled, "An Act to enable Jordan Langdale, of Cliff, in the County of York, to sue, or maintain any Action or Suit, notwithstanding his Outlawry; and to remove any Disability in him, by reason of his said Outlawry, to take or inherit any Real or Personal Estate that may or shall hereafter descend or come to him, and also such Real Estate as he was entitled unto, in Reversion or Remainder, before his said Outlawry," was committed: That they had considered the said Bill, and examined the Allegations thereof, which were found to be true; and that the Committee had gone through the Bill, and directed him to report the same to the House, without any Amendment." His Lordship made the like Report from the Committee to whom the Bill, intituled, "An Act for enlarging the Term and Powers granted by an Act passed in the Eighth Year of the Reign of His late Majesty King George the First, for repairing the Highways from The Stones End, at White Chapel Church, in the County of Middlesex, to Shenfield and the furthermost Part of the Parish of Woodford, leading to the Town of Epping, in the County of Essex; and for repairing the Road leading from the Causeway in the Parish of Low Layton (through Wanstead), to the End of the Parish of Woodford next to the Parish of Chigwell, in the said County of Essex," was committed. Message from H. C. to return Ongley's Bill. To return the Bill, intituled, "An Act to establish an Agreement made by the Devisees of Sir Samuel Ongley Knight, deceased, with Sir Roger Hudson Knight, for the Sale of Two Messuages on the East Side of Bishopgate Street, in the City of London; and for the Purchase of Two Messuages on the North Side of Threadneedle Street, in the said City of London, with Part of the Money arising from the said Sale; and for other Purposes therein mentioned;" and to acquaint this House, that they have agreed to the same, without any Amendment. Hodie 3a vice lecta est Billa, intituled, "An Act for Sale of the Manor of Kippax, in the County of York, Part of the settled Estate of Sir Reginald Graham Baronet; and for settling his Estates at Norton and Nunwick, in the same County, being of greater Value, to the same Uses; and for making a Partition of the Manor of Whitwell, between him and his Brother Richard Graham Esquire." Hodie 3a vice lecta est Billa, intituled, "An Act to disable Alexander Wilson Esquire from taking, holding, or enjoying, any Office or Place of Magistracy in the City of Edinburgh, or elsewhere in Great Britain; and for imprisoning the said Alexander Wilson; and for abolishing the Guard kept up in the said City, commonly called The Town Guard; and for taking away the Gates of The Nether-Bow-Port of the said City, and keeping open the same." Dominus Cancellarius declaravit præsens Parliamentum continuandum esse usque ad et in diem Lunæ, decimum sextum diem instantis Maii, hora undecima Auroræ, Dominis sic decernentibus. Universities, to prevent Interludes in, Bill. 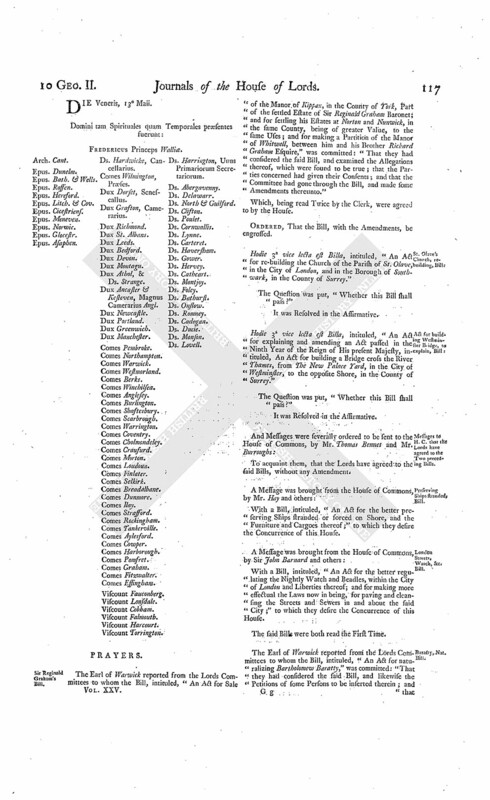 The House (according to Order) was adjourned during Pleasure, and put into a Committee, to consider further of the Bill, intituled, "An Act for the more effectual preventing the unlawful playing of Interludes, within the Precincts of the Two Universities, in that Part of Great Britain called England, and the Places adjacent; and for explaining and amending so much of an Act passed in the last Session of Parliament, intituled, "An Act for laying a Duty upon the Retailers of Spirituous Liquors, and for licensing the Retailers thereof," as may affect the Privilege of the said Universities with respect to licensing Taverns, and all other Public Houses, within the Precincts of the same." And the Earl of Warwick reported from the said Committee, "That they had gone through the Bill, and made some Amendments thereunto; which he was directed to report, when the House will please to receive the same." Hodie 2a vice lecta est Billa, intituled, "An Act for the better regulating the Nightly Watch and Beadles within the City of London and Liberties thereof; and for making more effectual the Laws now in being, for paving and cleansing the Streets and Sewers in and about the said City." L. B. St. Asaph. Ld. Abergavenny. Their Lordships, or any Five of them; to meet at the usual Time and Place on Thursday next; and to adjourn as they please. Pet. of Respondents to Walkingshaw's Appeal for Bye-day; to lie on the Table. A Petition of Mathew Crawfurd and James Corbet, Merchants in Glasgow, and of His Majesty's Advocate for Scotland; praying, "That some short Bye-day may be appointed, for hearing the Appeal of John Walkinshaw, to which the Petitioners are Respondents." Hodie 3a vice lecta est Billa, intituled, "An Act for enlarging the Term and Powers granted by an Act passed in the Eighth Year of the Reign of His late Majesty King George the First, for repairing the Highways from The Stones End, at White Chapel Church, in the County of Middlesex, to Shenfield and the furthermost Part of the Parish of Woodford, leading to the Town of Epping, in the County of Essex; and for repairing the Road leading from the Causeway in the Parish of Low Layton (through Wanstead), to the End of the Parish of Woodford next to the Parish of Chigwell, in the said County of Essex." Hodie 2a vice lecta est Billa, intituled, "An Act for the better preserving Ships stranded or forced on Shore, and the Furniture and Cargoes thereof." Ordered, That the said Bill be committed to a Committee of the whole House, To-morrow Sevennight. And the Exceptions stated in the Bill of Exceptions in the Record appearing to be grounded on the Act of Parliament made in the aforesaid Kingdom, in the Second Year of the Reign of Queen Anne, intituled, "An Act against the further Growth of Popery:"
Judgement affirmed, with 200 l. Costs. 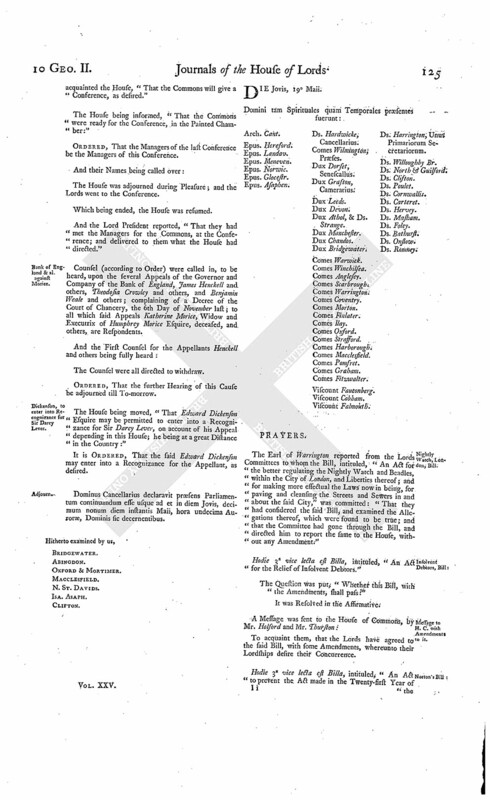 It is Ordered and Adjudged, by the Lords Spiritual and Temporal in Parliament assembled, That the said Judgement given in the said Exchequer Chamber, affirming the Judgement of the said Court of Exchequer, be, and the same is hereby, affirmed; and that the Transcript of the Record be remitted, to the End Execution may be had thereupon, as if no such Writ of Error had been brought into this House: And it is further Ordered, That the Plaintiff in Error do pay, or cause to be paid, to the said Defendant in Error, the Sum of Two Hundred Pounds, for his Costs sustained by reason of the bringing of the said Writ of Error. "Sed quia Cur. Parliamenti præd. nunc hic de Judic. suo de et super Præmiss. reddend. nondum advisatur, Dies inde dat. est Partibus præd. coram Domino Rege in Cur. Parliamenti sui præd. apud Westm. in Com. Middlesex assemblat. usque Diem Lunæ. Decimum Sextum Diem Maii extunc prox. sequen. de Judic. suo inde audiend. eo quod Cur. Parliamenti præd. hic inde nondum &c.; ad quem Diem, coram Domino Rege in eadem Curia Parliamenti præd. ven. Partes præd. per Attor. suos præd. ; super quo, vis. et per Cur. dicti Domini Regis Parliamenti sui præd. diligenter examinat. et inspect. tam Record. et Process. præd. ac Judic. super eisdem reddit. quam præd. Causis et Materiis per præd. Hugon. Montgomerie superius pro Error. assign. pro eo quod videtur Cur. Parliamenti præd. nunc hic, quod nec in Record. et Process. præd. nec in Redditione Judic. præd. nec in Affirmation. ejusdem in ullo est Errat. ac quod Record. ill. in nullo vitiosum aut defectivum in Lege existit; cons. est, quod tam Judic. præd. quam Affirmation. ejusdem in omnibus affirmentur, ac in omni suo Robore stent et Effectu, dictis Causis et Materiis superius pro Error. assign. in aliquo non obstant. Cons. est etiam per eandem Cur. Parliamenti præd. nunc hic, quod præd. Carol. Dempsy recuperet versus præfat. Hugon. Montgomerie Ducent. Libras, pro Mis. et Custag. præd. Carol. Dempsy per ipsum expens. in et circa Defensionem suam de et super Brevi de Error. præd. per præd. Hugon. Montgomerie de et super Præmiss. præd. sicut præfertur prosecut. ; et quod Record. præd. nec non Process. præd. in eadem Cur. Parliamenti in Præmiss. habit. remittuntur Baronibus de Scaccario in Regno Hib'niæ, ad Execution. super inde fiend. &c."
It is Ordered, That the House be put into a Committee thereupon To-morrow. Dominus Cancellarius declaravit præsens Parliamentum continuandum esse usque ad et in diem Martis, decimum septimum diem instantis Maii, hora undecima Auroræ, Dominis sic decernentibus. Sir Darcy Lever against Andrews. Upon reading the Petition and Appeal of Sir Darcy Lever Knight; complaining of a Decree of the Court of the Dutchy Chamber of Lancaster, pronounced the 3d Day of February last, but not drawn up and entered till the 3d Day of May Instant, made in a Cause wherein John Andrews Gentleman was Plaintiff, and the Appellant, by the Name of Darcy Lever Esquire, Defendant; and in a Cross Cause, wherein the Appellant was Plaintiff, and the said John Andrews Defendant; and praying, "That the same may be reversed; and that the said John Andrews may come to an Accompt with the Petitioner for the Rents and Profits of the Estate in Question, and be restrained from proceeding at Law in the Ejectment brought by him, and be decreed to deliver the Petitioner Possession of the said Estate; and may be compelled to convey the Premises to the Petitioner and his Heirs, in Execution of the Trust reposed in him; and that the Petitioner may be decreed to hold the said Premises against the said John Andrews and his Heirs; and that his Bill as against the Petitioner be dismissed, with Costs; and that such other Relief may be given the Petitioner as to their Lordships great Justice and Wisdom shall seem meet:"
It is Ordered, That the said John Andrews may have a Copy of the said Appeal; and he is hereby required to put in his Answer thereunto, in Writing, on or before Tuesday the First Day of June next. Hodie 3a vice lecta est Billa, intituled, "An Act for naturalizing Bartholomew Baratty." Abthorpe, &c. Chapel, to make a Parish Church, Bill. The Earl of Pomfret reported from the Lords Committees to whom the Bill, intituled, "An Act for making the Chapel in the Hamlet of Abthorpe and Foxcoate, in the Parish of Towcester, in the County of Northampton, a Parish Church; and for appointing a District or Parish thereto; and for enabling the Master of the Free Grammar School within the said Hamlet of Abthorpe and Foxcoate to be Vicar of the said Parish Church," was committed: "That they had considered the said Bill, and examined the Allegations thereof, which they found to be true; and that the Committee had gone through the Bill, and directed him to report the same to the House, without any Amendment." The Earl of Pomfret made the like Report from the Committee to whom the Bill, intituled, "An Act for enlarging the Term and Powers granted by an Act passed in the Ninth Year of the Reign of His late Majesty King George the First, intituled, "An Act for repairing and widening the Road leading from The Black Bull Inn, in Dunstable, in the County of Bedford, to the Way turning out of the said Road up to Shafford House, in the County of Hertford; and for preventing the driving of Cattle through private Grounds and Passages, to avoid the Payment of the Toll charged upon Cattle by an Act of the First Year of the Reign of His late Majesty;" and the Eighth Year of the Reign of His present Majesty, for repairing the Roads from South Mims to St. Albans, in the said County of Hertford," was committed. The Lord Abergavenny made the like Report from the Committee to whom the Bill, intituled, "An Act for explaining and amending, and making more effectual, several Acts of Parliament, made in the 4th, 6th, and 10th Years of the Reign of His late Majesty King George the First, respectively, for repairing the several Roads therein mentioned, in the Counties of Surrey, Kent, and Sussex; and for enlarging the Terms and Powers by the said Acts granted; and for repairing the Road lying between Nonesuch and Worcester Parks, in the Parish of Cuddington, in the said County of Surrey," was committed. Hodie 3a vice lecta est Billa, intituled, "An Act to enable Jordan Langdale, of Cliff, in the County of York, to sue, or maintain any Action or Suit, notwithstanding his Outlawry; and to remove any Disability in him, by reason of his said Outlawry, to take or inherit any Real or Personal Estate that may or shall hereafter descend or come to him, and also such Real Estate as he was entitled unto, in Reversion or Remainder, before the said Outlawry." Bill for preserving Ships stranded, to be printed. Ordered, That the Bill, intituled, "An Act for the better preserving Ships stranded or forced on Shore, and the Furniture and Cargoes thereof," be printed. To desire a Conference with this House, upon the Subject-matter of the Bill which came from their Lordships, intituled, "An Act to disable Alexander Wilson Esquire from taking, holding, or enjoying, any Office or Place of Magistracy in the City of Edinburgh, or elsewhere in Great Britain; and for imprisoning the said Alexander Wilson; and for abolishing the Guard kept up in the said City, commonly called The Town Guard; and for taking away the Gates of The NetherBow-Port of the said City, and keeping open the same." E. Pomfret. L. Bp. Landaff. Ld. Delawarr. The Earl of Warwick (according to Order) reported from the Committee of the whole House to whom the Bill, intituled, "An Act for the more effectual preventing the unlawful playing of Interludes, within the Precincts of the Two Universities, in that Part of Great Britain called England, and the Places adjacent; and for explaining and amending so much of an Act passed in the last Session of Parliament, intituled, "An Act for laying a Duty upon the Retailers of Spirituous Liquors, and for licensing the Retailers thereof," as may affect the Privilege of the said Universities, with respect to licensing Taverns, and all other Public Houses, within the Precincts of the same," was committed, the Amendments made by the Committee to the said Bill. Conference on the Bill against the Provost and City of Edinburgh. And the House was adjourned during Pleasure; and the Managers went to the Conference. "The Commons, in order to preserve that good Correspondence which is always so necessary to be kept up between both Houses, have desired this Conference, to acquaint your Lordships, That the Commons having entered upon the Consideration of the Bill, intituled, "An Act to disable Alexander Wilson Esquire from taking, holding, or enjoying, any Office or Place of Magistracy, in the City of Edinburgh, or elsewhere in Great Britain; and for imprisoning the said Alexander Wilson; and for abolishing the Guard kept up in the said City, commonly called The Town Guard; and for taking away the Gates of The NetherBow-Port of the said City, and keeping open the same;" and having read the same the First Time, and ordered it a Second Reading upon Wednesday the 25th of this Instant; do observe, that the Matters of Fact suggested in the said Bill, as the Grounds and Foundation upon which it seems to have proceeded in the House of Lords, do not sufficiently appear before the Commons: And therefore they have desired this Conference, that they may have the Assistance of the Lords, in laying the State of the said Matters of Fact before the Commons." Ordered, That a Conference be desired with the Commons, upon the Subject-matter of the last Conference; and that the Managers aforenamed be appointed a Committee, to prepare what shall be proper to be offered to the Commons, at the Conference. Their Lordships, or any Five of them; to meet immediately, in the Prince's Lodgings; and to adjourn as they please. The House (according to Order) was adjourned during Pleasure, and put into a Committee upon the Bill, intituled, "An Act for Relief of Insolvent Debtors." And the Earl of Warwick reported from the said Committee, "That they had gone through the Bill, and made some Amendments thereunto; which they had directed him to report, when the House will please to receive the same." The House (according to Order) was adjourned during Pleasure, and put into a Committee upon the Bill, intituled, "An Act to prevent the Act made in the Twenty-first Year of the Reign of King James the First, intituled, "An Act for Limitation of Actions, and for avoiding Suits in Law," being pleaded, insisted on, or taken Advantage of, by any Persons claiming under the last Will of Richard Norton Esquire, of Southwick, deceased, against any Claim, Title, or Demand, which Thomas Norton Esquire hath to or upon the Manor of Old Alresford, and Lands in the County of Southampton, settled by Indenture of the Fifth of March One Thousand Six Hundred and Fifty-seven, or the Rents and Profits thereof." And the Earl of Warwick reported from the said Committee, "That they had gone through the Bill, and made One Amendment thereunto; which they had directed him to report, when the House will please to receive the same." Ordered, That the House be put into a Committee upon the said Bill on this Day Sevennight. Dominus Cancellarius declaravit præsens Parliamentum continuandum esse usque ad et in diem Mercurii, decimum octavum diem instantis Maii, hora undecima Auroræ, Dominis sic decernentibus. Epus. Glocestr. Ds. Hardwicke, Cancellarius. Viscount Cobham. Ds. Harrington, Unus Primariorum Secretariorum. Hodie 3a vice lecta est Billa, intituled, "An Act for the more effectual preventing the unlawful playing of Interludes, within the Precincts of the Two Universities, in that Part of Great Britain called England, and the Places adjacent; and for explaining and amending so much of an Act passed in the last Session of Parliament, intituled, "An Act for laying a Duty upon the Retailers of Spirituous Liquors, and for licensing the Retailers thereof," as may affect the Privilege of the said Universities, with respect to licensing Taverns, and all other Public Houses, within the Precincts of the same." To acquaint them, that the Lords have agreed to the said Bill, with some Amendments, whereunto they desire their Concurrence. Message from thence, to return Trench's Bill. 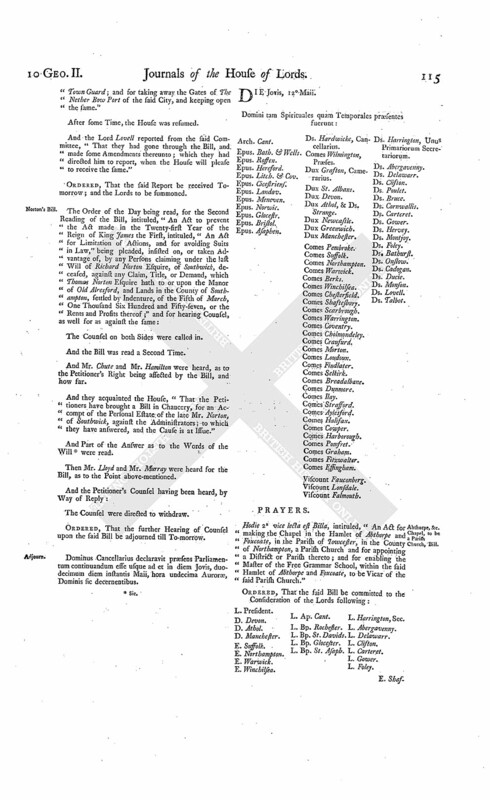 To return the Bill, intituled, "An Act to vest the Estates of Frederick Trench Esquire, in the Counties of Westmeath and Meath, in the Kingdom of Ireland, in Trustees, to sell the same, for the Purposes therein mentioned;" and to acquaint this House, that they have agreed to the same, without any Amendment. Heads for a Conterence on the Bill against the Provost and City of Edinburgh. "The Lords, having the same Disposition with the Commons, to maintain a perfect good Correspondence between the Two Houses, have desired this Conserence, to acquaint the Commons, That they having, at a Conference, desired the Assistance of the Lords, in laying more fully before them the State of the Matter of Fact, upon which the Bill, intituled, "An Act to disable Alexander Wilson Esquire from taking, holding, or enjoying, any Office or Place of Magistracy, in the City of Edinburgh, or elsewhere in Great Britain; and for imprisoning the said Alexander Wilson; and for abolishing the Guard kept up in the said City, commonly called The Town Guard; and for taking away the Gates of The Nether-Bow-Port of the said City, and keeping open the same," was grounded: The Lords have commanded us to lay before the Commons an authentic Extract of the Proceedings in the Trial of Captain Porteous; wherein is contained the Verdict against the said Captain Porteous, the Sentence of the Lords of the Justiciary in Scotland against him, and the Reprieve of the said Captain Porteous, granted by Her Majesty as Guardian of the Realm; and a Letter from Alexander Wilson, Provost of Edinburgh, to Major General Moyle, dated Edinburgh, 13th April, 1736. 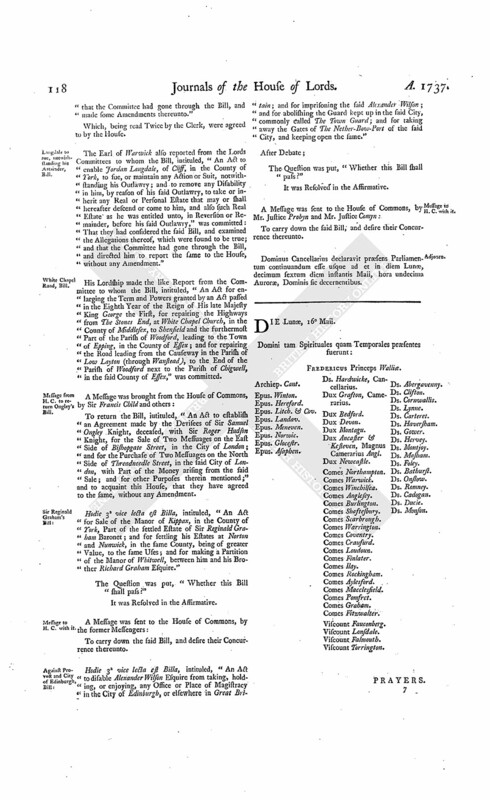 "The Lords have also commanded us to acquaint the Commons, That the said Bill was likewise grounded upon Evidence given by John Lyn a Captain Lieutenant of the City Guard, Robert Stewart, John Dinn, John Baily, Alexander Nisbet, Captain Bendish, Lieutenant Ashton, Major Roberton, Major General Moyle, Roderick Brown, Christopher Chissolm, and Lieutenant General Wade; which, in their Lordships Opinion, did make out the Allegations of the said Bill." To desire a present Conference with that House, in the Painted Chamber, upon the Subject-matter of the last Conference. Duty on Sweets, &c. Bill. 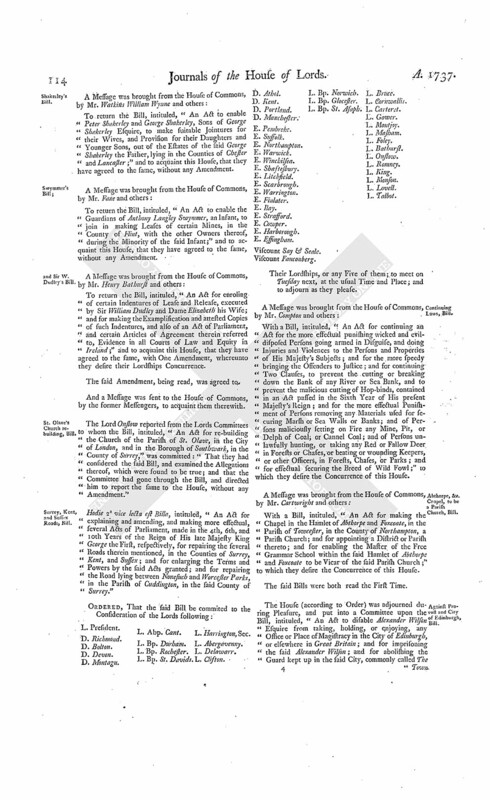 With a Bill, intituled, "An Act for repealing the present Duty on Sweets, and for granting a less Duty thereupon; and for explaining and enforcing the Execution of an Act passed in the Ninth Year of His present Majesty's Reign, intituled, "An Act for laying a Duty upon the Retailers of Spirituous Liquors, and for licensing the Retailers thereof;" and for appropriating the Supplies granted in this Session of Parliament; and for making further Duplicates of Exchequer Bills, Lottery Tickets, and Orders, lost, burnt, or otherwise destroyed;" to which they desire the Concurrence of this House. E. of Anglesey's Complaint, concerning the Proceedings of Mr. Annesley & al. in Ireland. Ordered, That the Matter of the said Complaint be, and is hereby, referred to the Consideration of the Lords Committees for Privileges. 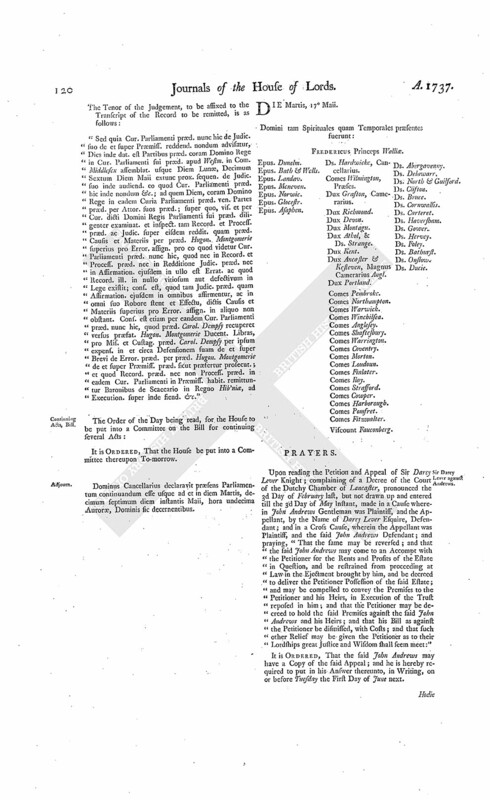 Upon reading the Petition of Francis Annesley Esquire; praying, "That he may be permitted to lay before this House such Facts as may enable their Lordships to judge, whether what hath been done by Charles Annesley Esquire and the other Persons complained of by the Earl of Anglesey may deserve any Censure; and that they may be heard by their Counsel:"
It is Ordered, That the said Petition be referred to the Lords Committees for Privileges, to whom the Matter of the Complaint of the said Earl of Anglesey, of a Breach of Privilege, stands referred. The Earl of Warwick (according to Order) reported from the Committee of the whole House to whom the Bill, intituled, "An Act for Relief of Insolvent Debtors," was committed, the Amendments made by the Committee to the said Bill. The Earl of Warwick also (according to Order) reported from the Committee of the whole House to whom the Bill, intituled, "An Act to prevent the Act made in the Twenty-first Year of the Reign of King James the First, intituled, "An Act for Limitation of Actions, and for avoiding Suits in Law," being pleaded, insisted on, or taken Advantage of, by any Persons claiming under the last Will of Richard Norton Esquire, of Southwick, deceased, against any Claim, Title, or Demand, which Thomas Norton Esquire hath to or upon the Manor of Old Alresford, and Lands in the County of Southampton, settled by Indenture of the Fifth of March One Thousand Six Hundred and Fifty-seven, or the Rents and Profits thereof," was committed, the Amendment made by the Committee to the said Bill. "Press 4, Line 5. After ["made"], add ["Provided also, that this Act shall not extend to prejudice the next of Kin of the said Richard Norton, as to such Part of the said Personal Estate as they, or any of them, may hereafter be adjudged to be entitled to; but that so much of the Personal Estate of the said Richard Norton as shall be recovered by the said Thomas Norton shall be subject to any Demand to be made by such next of Kin, in like Manner as if this Act had never been made."]" Hodie 3a vice lecta est Billa, intituled, "An Act for making the Chapel in the Hamlet of Abthorpe and Foxcoate, in the Parish of Towcester, in the County of Northampton, a Parish Church; and for appointing a District or Parish thereto; and for enabling the Master of the Free Grammar School within the said Hamlet of Abthorpe and Foxcoate to be Vicar of the said Parish Church." Hodie 3a vice lecta est Billa, intituled, "An Act for enlarging the Term and Powers granted by an Act passed in the Ninth Year of the Reign of His late Majesty King George the First, intituled, "An Act for repairing and widening the Road leading from The Black Bull Inn, in Dunstable, in the County of Bedford, to the Way turning out of the said Road up to Shafford House, in the County of Hertford; and for preventing the driving of Cattle through private Grounds and Passages, to avoid the Payment of the Toll charged upon Cattle by an Act of the First Year of the Reign of His late Majesty;" and the Eighth Year of the Reign of His present Majesty, for repairing the Roads from South Mims to St. Albans, in the said County of Hertford." Hodie 3a vice lecta est Billa, intituled, "An Act for explaining and amending, and making more effectual, several Acts of Parliament, made in the Fourth, Sixth, and Tenth Years of the Reign of His late Majesty King George the First, respectively, for repairing the several Roads therein mentioned, in the Counties of Surrey, Kent, and Sussex; and for enlarging the Terms and Powers by the said Acts granted; and for repairing the Road lying between Noncsuch and Worcester Parks, in the Parish of Cuddington, in the said County of Surrey." Messages to H. C. that the Lords have agreed to the Three preceding Bills. The House (according to Order) was adjourned during Pleasure, and put into a Committee upon the Bill, intituled, "An Act for regulating the Company of Watermen, Wherrymen, and Lightermen, rowing on the River Thames, between Gravesend, in the County of Kent, and Windsor, in the County of Berks." Conference, on the Bill against the Provost and City of Edinburgh. The Messengers sent to the House of Commons, to desire a present Conference with that House, upon the Subject-matter of the last Conference, being returned; acquainted the House, "That the Commons will give a Conference, as desired." The House being informed, "That the Commons were ready for the Conference, in the Painted Chamber:"
The House was adjourned during Pleasure; and the Lords went to the Conference. And the Lord President reported, "That they had met the Managers for the Commons, at the Conference; and delivered to them what the House had directed." Bank of England & al. against Morice. 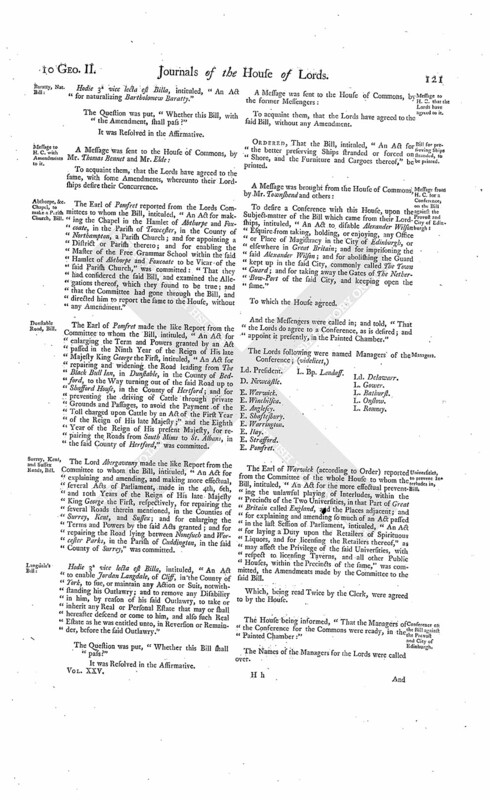 Counsel (according to Order) were called in, to be heard, upon the several Appeals of the Governor and Company of the Bank of England, James Henckell and others, Theodosia Crowley and others, and Benjamin Weale and others; complaining of a Decree of the Court of Chancery, the 6th Day of November last; to all which said Appeals Katherine Morice, Widow and Executrix of Humphrey Morice Esquire, deceased, and others, are Respondents. The Counsel were all directed to withdraw. Dickenson, to enter into Recognizance for Sir Darcy Lever. The House being moved, "That Edward Dickenson Esquire may be permitted to enter into a Recognizance for Sir Darcy Lever, on account of his Appeal depending in this House; he being at a great Distance in the Country:"
It is Ordered, That the said Edward Dickenson may enter into a Recognizance for the Appellant, as desired. Dominus Cancellarius declaravit præsens Parliamentum continuandum esse usque ad et in diem Jovis, decimum nonum diem instantis Maii, hora undecima Auroræ, Dominis sic decernentibus. The Earl of Warrington reported from the Lords Committees to whom the Bill, intituled, "An Act for the better regulating the Nightly Watch and Beadles, within the City of London, and Liberties thereof; and for making more effectual the Laws now in being, for paving and cleansing the Streets and Sewers in and about the said City," was committed: "That they had considered the said Bill, and examined the Allegations thereof, which were found to be true; and that the Committee had gone through the Bill, and directed him to report the same to the House, without any Amendment." Hodie 3a vice lecta est Billa, intituled, "An Act for the Relief of Insolvent Debtors." The Question was put, "Whether this Bill, with the Amendments shall pass?" Hodie 3a vice lecta est Billa, intituled, "An Act to prevent the Act made in the Twenty-first Year of the Reign of King James the First, intituled, "An Act for Limitation of Actions, and for avoiding Suits in Law," being pleaded, insisted on, or taken Advantage of, by any Persons claiming under the last Will of Richard Norton Esquire, of Southwick, deceased, against any Claim, Title, or Demand, which Thomas Norton Esquire hath to or upon the Manor of Old Alresford, and Lands, in the County of Southampton, settled by Indenture of the Fifth of March One Thousand Six Hundred and Fifty-seven, or the Rents and Profits thereof." To acquaint them, that the Lords have agreed to the said Bill, with One Amendment, whereunto their Lordships desire their Concurrence. Bank of England, &c. against Morice. 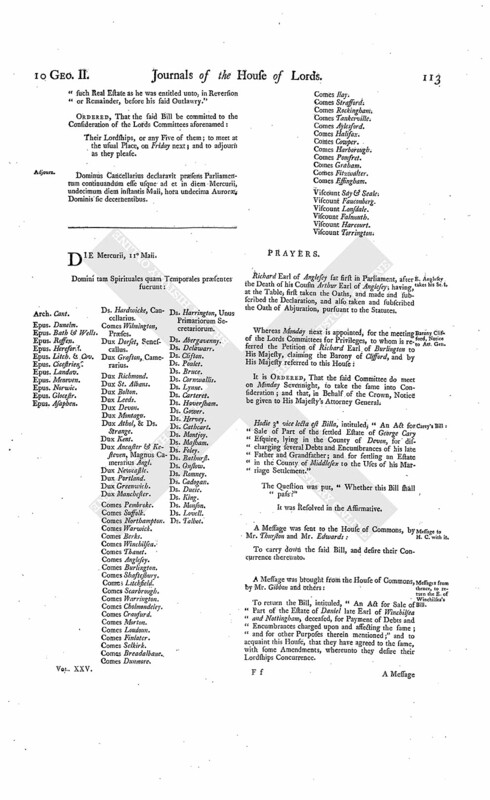 Counsel (according to Order) were called in, to be further heard, upon the several Appeals of the Governor and Company of the Bank of England, James Henckell and others, Theodosia Crowley and Joseph Gascoigne Nightingale Esquire, and Benjamin Weale and others; complaining of a Decree of the Court of Chancery, the 6th Day of November last; to all which said Appeals Katherine Morice, Widow and Executrix of Humphrey Morice Esquire, deceased, and others, are Respondents. The First Counsel for the Appellants Crowley and Nightingale was fully heard. Dominus Cancellarius declaravit præsens Parliamentum continuandum esse usque ad et in diem Veneris, vicesimum diem instantis Maii, hora undecima Auroræ, Dominis sic decernentibus. Against the Murderers of Captain Porteous, Bill. The Earl of Ilay presented to the House a Bill, intituled, "An Act for the more effectual bringing to Justice any Persons concerned in the barbarous Murder of Captain John Porteous; and for other Purposes therein mentioned." With a Bill, intituled, "An Act for laying a Duty upon Apples imported from Foreign Parts; and for continuing an Act passed in the Fourth Year of the Reign of His present Majesty, for granting an Allowance upon the Exportation of British-made Gunpowder; and for taking off the Drawback upon Exportation of Foreign Paper; and for the better securing the Payment of the Bounty on the Exportation of British-made Sail Cloth; and for giving further Time for the Payment of Duties omitted to be paid for the Indentures and Contracts of Clerks and Apprentices;" to which they desire the Concurrence of this House. With a Bill, intituled, "An Act for the better regulating the Nightly Watch and Beadles, within the Liberty of Saffron Hill, Hatton Garden, and Ely Rents, in the Parish of St. Andrew Holborn, in the County of Middlesex;" to which they desire the Concurrence of this House. The last mentioned Bill was read the First Time. 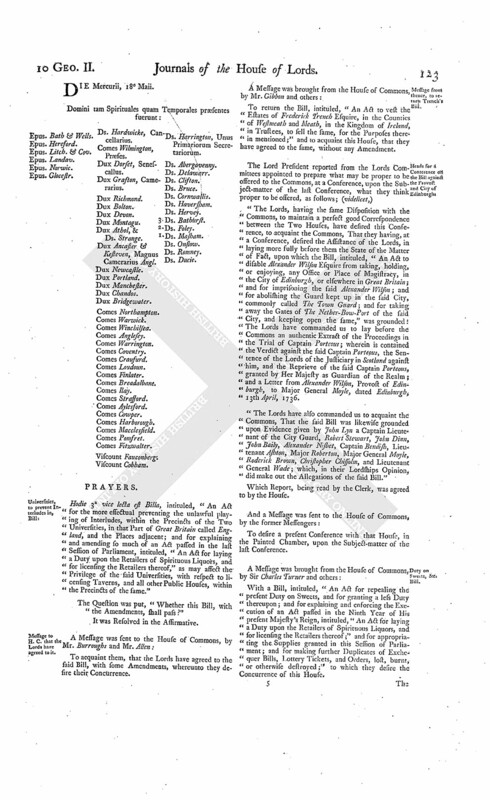 Counsel (according to Order) were called in, to be further heard, in the Cause wherein the Governor and Company of the Bank of England, James Henckell and others, Theodosia Crowley and Joseph Gascoigne Nightingale, and Benjamin Weale and others, are Appellants, and Katherine Morice and others are Respondents. The Counsel for the Appellants the Governor and Company of the Bank of England were both heard. As was likewise the Counsel for the Appellants Benjamin Weale and others. Dominus Cancellarius declaravit præsens Parliamentum continuandum esse usque ad et in diem Sabbati, vicesimum primum diem instantis Maii, hora undecima Auroræ, Dominis sic decernentibus.